Following my previous posts about procedural generation tools in the process of game design, i wanted to highlight one particular software that has caught my attention in relation to this. Esri CityEngine is a three-dimensional (3D) modeling software application developed by Esri R&D Center Zurich (formerly Procedural Inc.) and is specialized in the generation of 3D urban environments. With the procedural modeling approach, CityEngine supports the creation of detailed large-scale 3D city models. 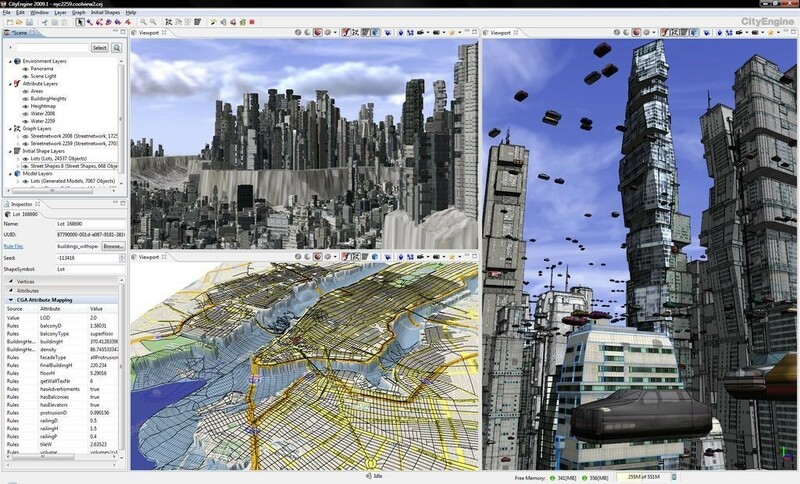 CityEngine works with architectural object placement and arrangement in the same manner that VUE manages terrain, ecosystems and atmosphere mapping. Unlike the traditional 3D modeling methodology which is using Computer-Aided Design (CAD) tools, CityEngine improves the shape generation via the rule-based system and data sets—similar as the Geographic Information System (GIS). Due to this dominant feature, CityEngine has been broadly used in academic research or building virtual environments, e.g., urban planning, architecture, visualization, game development, entertainment, GIS, archeology, and cultural heritage. After being integrated with the Building Information Model (BIM), CityEngine can visualize the data of buildings in a larger urban context, enhancing its working scenario toward real construction projects. The ability to quickly generate cities out of real data and information will allow for the creation of “limbo”, creating cities that are highly convincing, immersive and precise. A recent example of this is is the new Bladerunner. It uses this very software to generate majority of its dystopian cityscapes.